Once you have setup a Paypal bank account and linked this to your Paypal account, you can use our guide linked here, to import statements directly from Paypal. Navigate to Money > Bank accounts. Click on the Add Account button. 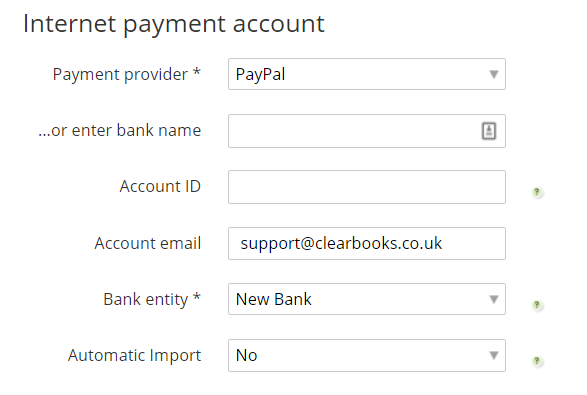 Click the plus icon next to Internet payments to create a Paypal account in Clear Books. Configure the bank account as shown below. Select payment provider as Paypal, bank group to New Bank and set the default currency to your Paypal account's currency. Select whether to attempt automatic imports and also enable an option to include a Paypal payment button on statements. IMPORTANT the email account must be set to the email address of the Paypal account you intend to import from. Once this has been done hit the Save button. You will then be sent a verification request email which you must verify before you begin importing.